"I Can Do This! – Pass It On"
The District 45 Toastmasters Spring Conference was held this last weekend, on May 23-25, 2014, at the DoubleTree by Hilton Hotel in South Portland, Maine. Because this conference was hosted so locally to me, the District 45 Leadership officially celebrated my new DTM this weekend. 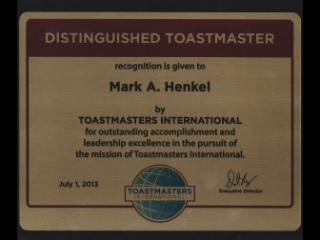 This official recognition involved receiving the special “Distinguished Toastmaster” lapel-pin and then “running the gauntlet” – passing through a congratulatory procession of existing DTMs.